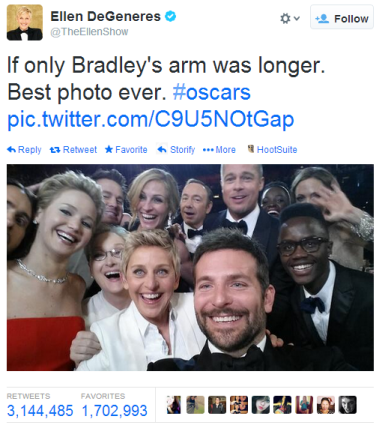 Actress Ellen DeGeneres set out to create the most viral selfie ever on Oscar night and succeeded not just in capturing a celebrity moment but a digital one, too. Taking a “selfie” was relatively difficult to pull off before digital phones and cameras made them easy. Not surprisingly, the generation that has taken to them more than any other are the Millennials (ages 18 to 33), who have grown up with the new digital technologies of the 21st century. They’re the heaviest users of the internet, cell phones and social media sites. 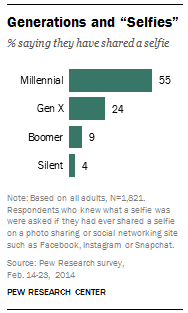 And a new Pew Research Center survey finds that 55% of Millennials have posted a “selfie” on a social media site; no other generation is nearly as inclined to do this. Overall, 26% of Americans have shared a “selfie” on a photo-sharing or social networking site. Indeed, our new survey — taken a few weeks before Oscar night — found only about six-in-ten Baby Boomers and about a third of the Silent Generation say they know what a “selfie” is—though the term had acquired enough cachet to be declared the Oxford Dictionaries “word of the year” in 2013. However, there’s some self-awareness of the downside to the “selfie” culture. Nine-in-ten Millennials say people generally share too much information about themselves online, a view held by similarly lopsided proportions of all older generations. Here are more detailed results and survey methodology.